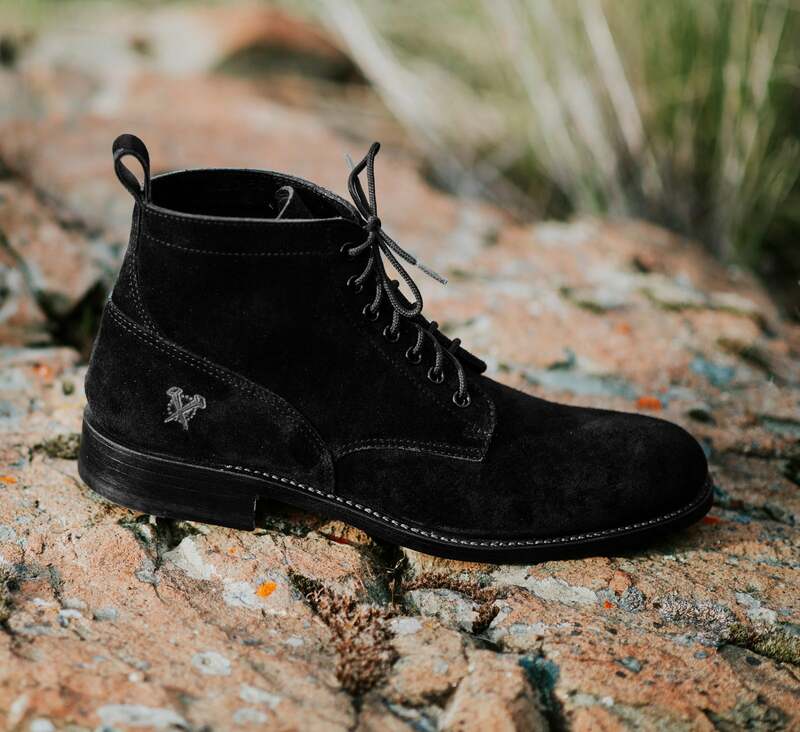 Please select the color of Charles F Stead "Repello" calf suede you'd like us to build your custom 808Ds out of. If you're interested in a two-tone color combination, please select “Two-tone” here, and then fill us in on what you have in mind in the space allotted below. Please let us know exactly how you'd like us to lay out your two-tone upper by using the upper panel names noted below to describe your vision. Let us know if you'd like your boots hand-welted (and outstitched) or not. The welt/ faux-welt is that piece of leather that surrounds the outside of the upper (visible from above) and looks to the untrained eye to be part of the leather sole, but in fact is separate from. The difference between a true welt and a faux welt, other than aesthetics is durability/ lifespan and water resistance. Where the true welt is cross-stitched by hand (2 - 3 hours per pair) to the upper, the faux welt is cemented. The true welt is then machine stitched (outstitched) through the full leather sole outside the upper, where the faux-welt is machine (Blake) stitched through the upper (stitch is not exposed), through the full leather sole. Both types of sole construction are extremely durable, and if maintained and cared for, should last 10+ years. However, hand-welted is MORE durable (there's gotta be a top dog) and in our humble opinion (whatever that's worth) is more aesthetically pleasing. The choice is yours. 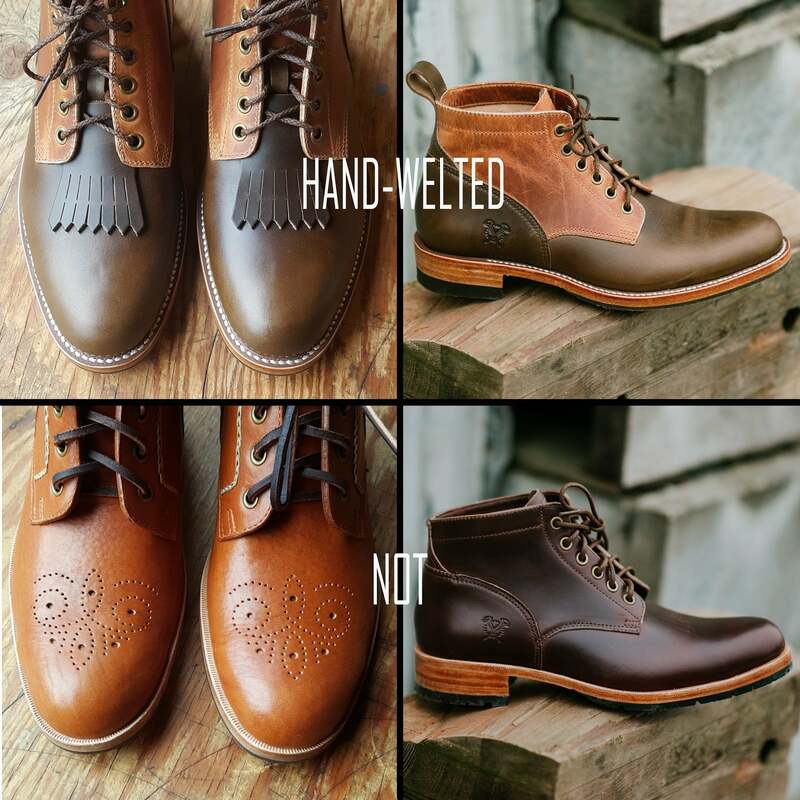 Each pair of 808Ds will come with a German (J. Redenbach) oak bark pit tanned full leather sole and stacked heel. 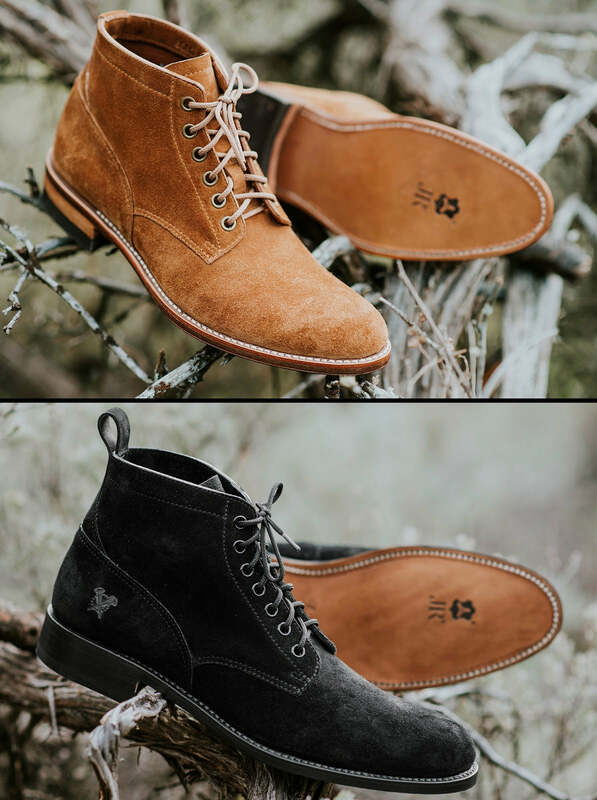 The sole that accompanies "Jet black" suede uppers will be dyed/ finished black, while the sole that accompanies "Bright Toffee" uppers will be finished natural. You can either choose to have your full-leather sole protected with a Vibram rubber half sole, or left uncovered (as pictured). If you intend to be wearing these in marginal conditions, we'd recommend a protective rubber half sole out of the box, as the eventual repair/ replacement is extremely straight-forward. Should you opt for an uncovered full-leather sole, the soles will be stunning (obviously) out of the box, but scuffed within a wear or two. Though German oak bark pit tanned soles are the most durable full-leather soles on the market, they're still an organic material and will break down quicker with exposure to wet environments. Now you can always choose to have your full-leather sole covered after-the-fact by a cobbler, it's just an easier installation for us during the initial sole build. The choice is yours - based on how (and when) you intend to rock your 808Ds. Please Choose... Uncovered full leather soles. Protective rubber half soles please. This is a first for us. Though we always brand the outside right heel/ counter (as pictured below), for all previous releases we've designated the outside left heel/ counter as etchable realestate - you'd choose your own adventure as far as artwork goes, and we'd hand-etch it with our trusty ol' hot pen. What's different with this release is that... suede is not etchable - it simply burns. So, what we're going to do is... commission the manufacturing of five separate embossing dies, so if you'd like to further personalize your pair of 808Ds with a counter image, you still can. Too, should you prefer to have your own custom image embossed, we'd be happy to source the stamp for you, we'll simply need to charge an additional fee for the design time and tooling cost. Please Choose... None - I'd prefer my left outside counter to be naked. Our logo (pictured) Our 808 traditional tattoo inspired Crying Heart. A traditional tattoo inspired Desert Rose. A simple campfire. A Pacific Northwest inspired mountainscape. Custom (+$100) - Please provide details below. Select Custom embossed artwork (If you selected this option above) - Details. The realestate we're working with is small (aprox. 1.5" squared), and though this suede embosses pretty great, if the imagery is too fine/ detailed, it might not translate. So please keep that in mind when dreaming up imagery. Describe in as much detail as you can here what you're looking for (for example if you're looking for a monogram include the font/ typography you'd like us to use) and we'll get back in touch to finalize a plan. If you can provide the image and very little additional design time is required to guarantee (we'll letcha know) a successful stamp, we'll simply charge an extra $100 CAD to cover the tooling cost. If you need us to come up with the image, based on an idea or loose reference material, we'll provide you a quote for the extra design time required. Just provide as many details as you can here, and we'll get back ASAP with our thoughts and questions to clarify anything that needs clarifying. Below, we're going to walk you through a self-measurement. We're going to require 5 measurements (LENGTH, SHORT HEEL, INSTEP, BALL, and ANKLE), but to double check you've taken those measurements accurately, please provide us with your average shoe size here (Please include whether the size you're providing is in US/ UK or Euro as well as Men's or Women's). I know your size likely varies across brands/ styles, so simply let us know what size of shoe you tend to purchase most often than not. Too, if this is a surprise gift pair, we realize it's unlikely you'll be able to sneakily obtain the measurements we need to ensure a perfect/ custom fit, but as our shoes do fit "true", we can more often then not avoid a mis-size, if you're able to provide us with the average shoe size of the eventual gift getter (at the very least this will be a good starting point, but we'll likely have you do a little more sleuthing for us to ensure we hit these out of the park). Are you local? If so, do you have time to swing by our East Van shop for an In-studio fitting? If the answer is yes, you can ignore the next 5 questions. We'll get in touch shortly to have you by the shop so we can measure up your funky feet ourselves. Please Choose... Yes - I'll see you guys soon. No I'm a return customer, you already have my measurements on file. Firstly: Place a ruler against a nice flat wall with the '0' at the point where the wall intersects the floor (see #1 below). If the '0' is inset from the end of the ruler, please note how inset it is (1/8" is fairly common), and add that extra length (the length of the inset) to your foot measurement. Secondly: Place one foot at a time on the ruler with your heel against the wall. Note: Please ensure while measuring, you're wearing the thickness of sock you intend to be wearing while wearing your boots. 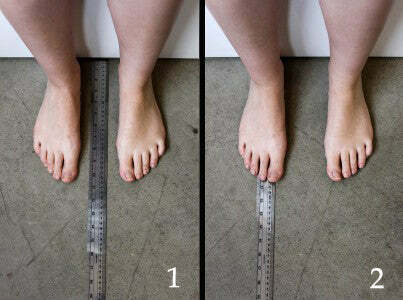 Place the longest part of your foot over the ruler measurement (this may not be your big toe). - Look straight down onto the ruler and note the measurement. Be sure to look down so you are seeing the measurements at right angle to the ruler, if your toes are up slightly off the ruler then the angle at which the measurement is viewed can change the measurement you record. - Also it is important that you are evenly bearing your weight on both feet, in a nicely rested and neutral position, don't put all of your weight on one foot or the other. Repeat this for the other foot, note that they may be slightly different lengths (this is quite common - see below). Note the length of both your left and right feet here. You will need a flexible "dress maker's" tape measurer (these are readily available at most supermarkets, hardware stores and even Ikea). If you can't find one, a piece of string/ lace will work just as well (you'll obviously just have to measure the length of string after the fact - it's a two-step process). Wrap the tape (or alternative) around the back of your heel at the bottom to the front of your ankle at the top and record the measurement where the tape overlaps. Note: Please ensure while measuring, you're wearing the thickness of sock you intend to be wearing while wearing your boots. It's important that the tape is neither too loose nor tight - you want it to be taught but not tight (See image below for reference). Note the width (circumference) of the "short heel" on your right foot (the measurement of one foot is adequate for our purposes) here. Take the flexible tape measurer (or alternative) forward and wrap it around the high point of your arch/instep. Note: Please ensure while measuring, you're wearing the thickness of sock you intend to be wearing while wearing your boots. Again, it's important that the tape is neither too loose nor too tight - you want it to be taught but not tight (See image below for reference). Note the width (circumference) of the "instep" on your right foot (the measurement of one foot is adequate for our purposes) here. The 2nd to last measurement we need from you (we're almost there!) is the ball (joint) of your foot. This measurement is done across the widest point of your foot and should be on a slight angle (further forward on the big toe side than the pinky). It should be taken at the widest point of your first big toe joint and the widest point of your pinky toe joint. Note: Please ensure while measuring, you're wearing the thickness of sock you intend to be wearing while wearing your boots. Again, it's important that the tape is neither too loose nor too tight - you want it to be taught but not tight (See image below for reference). Note the width (circumference) of the "ball" of your right foot (the measurement of one foot is adequate for our purposes) here. The final measurement we need from you is the width of your ankle. Sorry we don't have a picture guide at this time, but it's pretty straight forward. This measurement is taken around your ankle (tape measurer parallel to the ground) two centimeters above your inner ankle bone. Note: Please ensure while measuring, you're wearing the thickness of sock you intend to be wearing while wearing your boots. Again, it's important that the tape is neither too loose nor too tight - you want it to be taught but not tight. Note the width (circumference) of your right ankle (the measurement of one foot is adequate for our purposes) here.